Designed and built between 1902 and 1908, based on the model of noble houses on the Island of Delos (2nd century BC. ), Villa Kérylos is not a simple reproduction but a reinvention of ancient Greece. Far from a pastiche, for Théodore Reinach and Emmanuel Pontremoli it was about creating an original piece of work while "thinking Greek". The house subtly combines ancient luxury with the modern comfort of Belle Epoque villas. Its construction uses the most precious materials: ancient stucco, Carrara marble and exotic wood for the furniture. The decoration is sumptuous: mosaics and frescoes inspired by famous scenes, illustrating the great legends of gods and classic heroes. The villa is organised around a peristyle with a large inner courtyard surrounded by 12 columns in Carrara marble. On the ground floor are the state rooms, while the bedrooms and bathrooms are located upstairs. "Kérylos" means "sea swallow", a poetic bird of mythology, which announced a good omen. 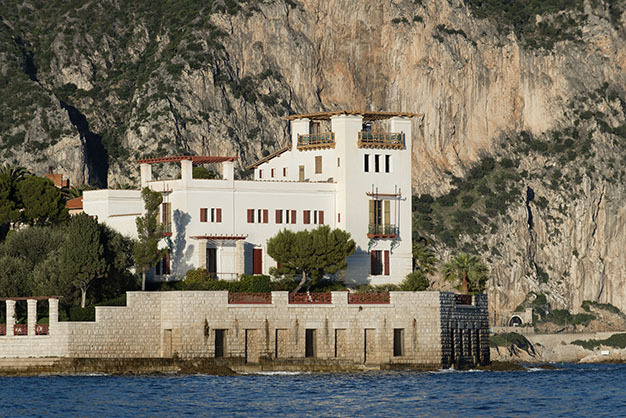 Like all the villas built during the Belle Epoque, the villa Kérylos was also a leisure home. Théodore Reinach spent his holidays there with his family. On his death in 1928, he bequeathed the villa to the Institut de France, of which he was a member. His children and grandchildren continued to live in the house until 1967 when it became listed as a historical monument. This remarkable achievement is also, and above all, the desire of Théodore Reinach who could have been a Renaissance man with the many facets to his knowledge and his boundless curiosity. Born in 1860 into a family of German bankers, Théodore Reinach showed exceptional intellectual abilities from a very early age, like his two brothers, Joseph and Salomon. He had a special place in this sibling group nicknamed the "Je Sais Tout" / "I Know Everything" (the initials of their first names), as he had so many talents. He was a lawyer, archaeologist, numismatist, historian, sociologist and mathematician. He also conducted a political career in Paris and Savoie for which he was elected a member of Parliament in 1906. His passion for ancient Greece led him to become one of the leading Hellenists of the century. From his encounter with architect Emmanuel Pontremoli a complete architectural work was born, which takes visitors into a world where the quintessence of Greek civilisation is incorporated into the modernity of the early 20th century, which glorified technical prowess. 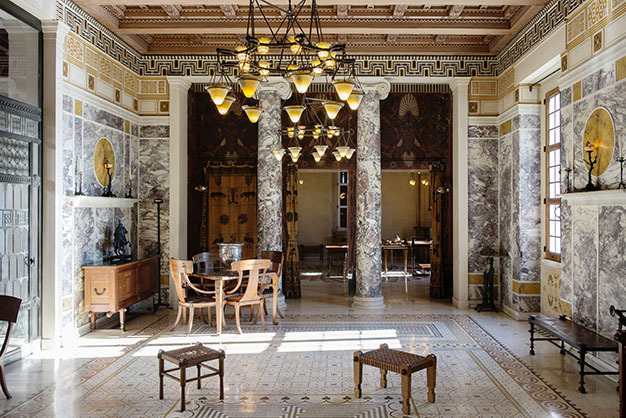 Théodore Reinach not only created a Greek house, but also reproduced its furniture, tableware, fabrics and decoration. Villa Kérylos is the result of both artistic and intellectual research. because for him, democracy had its roots in Greece and his work sought to perpetuate it. Villa Kérylos thus not only bears testimony to this art of living but is also a tribute to the invention of a civilisation in which mankind is at the centre of the world. "I feel that it was the realisation and accomplishment – beyond the diversity of his knowledge, activities and work – of what represented for my grandfather the very essence of a civilisation with an essentially human face like that of the Greeks, their gods and their Art, a model and way of thinking, and a set of literary, political and philosophical values that ancient Greece has passed on to us. The Greek Spirit was for him both dream and reality, memory and present."